http://catalog.vaccon.com/advanced/modular-venturi-pumps/vp80-200-max-seriesThe VP80-200 and VP80BV-200 Max Series air-powered venturi vacuum pumps provide high vacuum flow rates for the rapid evacuation of large volumes of air or for overcoming leakage in order to sustain high vacuum levels while handling porous materials. The VP80BV-200 Max Series pumps offer an integrated valve for increased production cycles. Highly efficient, capable of reaching 28"Hg [948mbar], the VP80’s are also dirt tolerant and include a straight-through silencer for quiet operation. Unlike the Mid Series pumps that use interchangeable cartridge assemblies, the Max Series pumps (VP80 & VP90’s) use a non-removable press-fit venturi assembly. 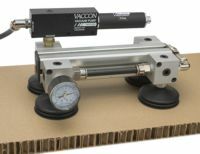 Similar to the VP20 series, the VP80-200 offer an optional integrated solenoid valve for vacuum control and increased production cycles. Dimensional data for the VP80-200 and VP80BV-200 series modular venturi vacuum pump is presented in 2D drawings, with all critical dimensions and port thread sizes displayed. Both imperial and metric units are included. Performance data for the VP80-200 and VP80BV-200 Max series modular venturi vacuum pumps is displayed, listing air consumption, vacuum flow at various vacuum levels, and evacuation times (for 1 cu. ft. or 1 L volumes). Data is presented in tabular and graphed formats, in both imperial and metric units.